Waking up to the beep of the waffle iron signaling that a golden delicious waffle is ready is a Saturday morning memory that lasts a lifetime. Just because you are avoiding grains doesn’t meal that this tradition has to stop! 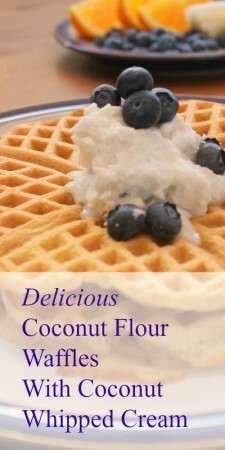 These coconut flour waffles are delicious, can be topped with delicious toppings like coconut whipped cream and blueberries, and even make a great sandwich bread when used as leftovers. I like to make this batter in the blender, but it can easily be mixed in a bowl with a whisk or fork if desired. 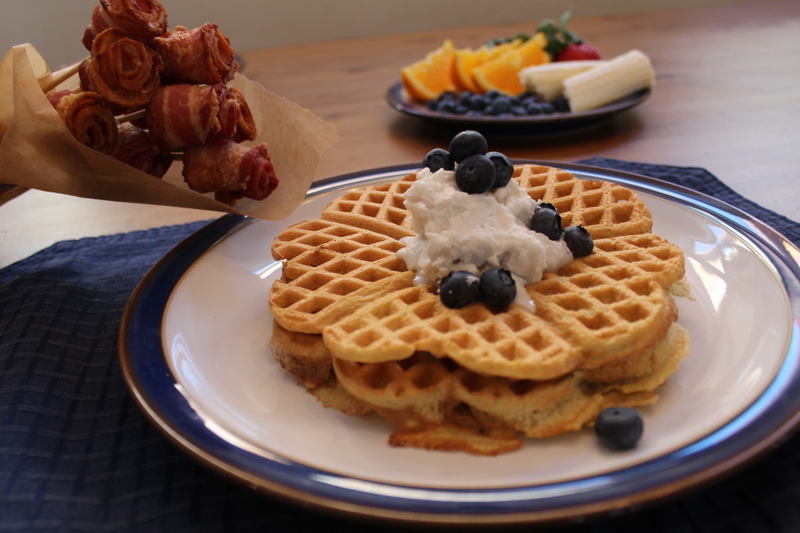 It produces waffles that are light and fluffy, they’re family favorites! 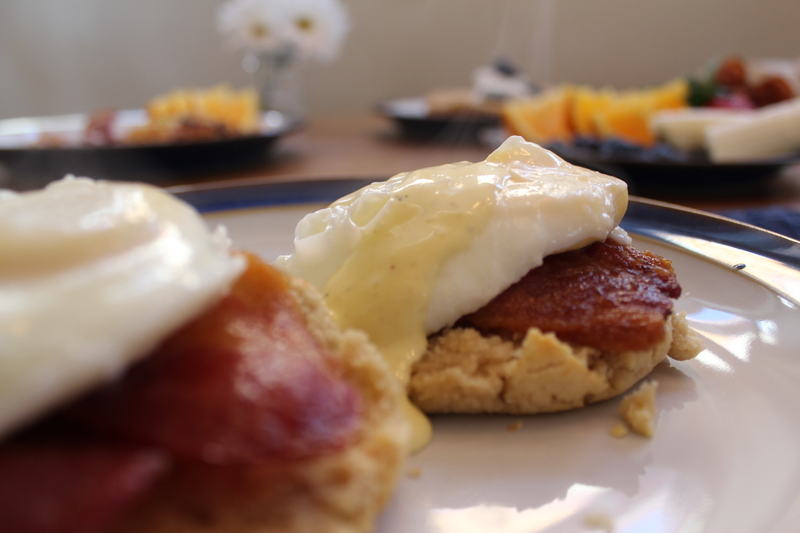 In a blender, combine melted fat, coconut flour, eggs, vanilla and honey. Blend until coconut flour is evenly distributed, using a spatula to free any pockets from the bottom or side of the blender. Add in the apple sauce and salt and blend again until well combined. Allow to sit for 5 minutes so the coconut flour can absorb the liquid. Preheat waffle iron, grease generously with coconut oil. Use a serving spoon or 1/8 cup measuring cup distribute the batter on the iron and cook 3-4 minutes, or until golden brown. I’m using this waffle maker. If the waffles stick, make sure you are greasing the waffle iron well (even if it is nonstick) between each waffle. The apple sauce can be omitted, or replaced with baked, pureed squash. The fruit or squash provides moisture and helps the waffles to be less dense and a little bit more sweet. If your waffles crumble, make sure you’re allowing the batter to sit for 5-10 minutes to absorb the liquid. To freeze: Lay flat on a baking sheet and then combine into a zip-top bag once frozen, or stack, separated by squares of parchment paper, and freeze in the zip-top bag. Do you recommend a waffle maker? I am reluctant to use a non stick one because of the Teflon but can’t find any other options. These waffles look wonderful and my daughter would just love the novelty value. I’d love to see this question answered! Wondering the same thing. Cara, I just love this waffle recipe. 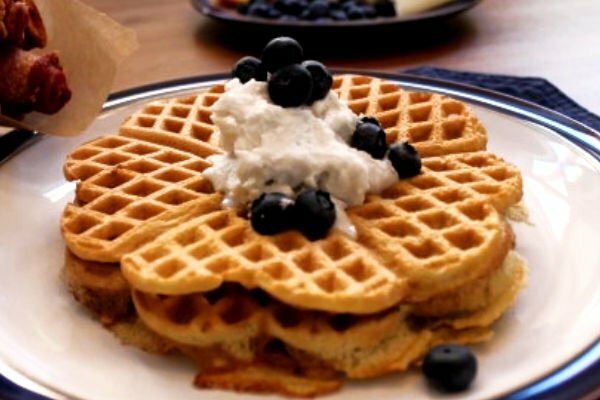 You ought to try the cassava flour waffle recipe.I think your family would just love it! Thanks so much! Our favorite waffle recipe!!! We use it all the time! Thank you!! Does this really need two TABLESPOONS of vanilla extract?? That seems excessive, I’ve never seen even one tablespoon used in any recipe. I’d hate to waste two tablespoons of vanilla extract and all of the other ingredients.